For review of all books under Murder, She Wrote series: Go here. Recommendation: Definite pick if you are looking for a good mystery. A trip to San Francisco to promote her new book - Blood Relations - lands Jessica Fletcher in the midst of a closed case, attempted murder and media frenzy that she might right books on real murders. Needless to say she ends up meddling with the law, so to speak, in solving the cold case too. 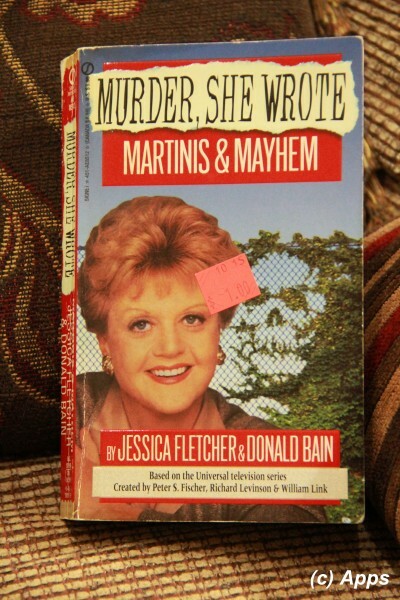 That's what the story plot revolves around in this 1995 book Martinis & Mayhem written by Donald Bain and Jessica Fletcher. Jessica Fletcher was more than happy to go to San Francisco to promote her new book, giving her a chance to escape the heat wave in Cabot Cove. She was also looking forward to spend a few days with George Sutherland, her friend that she had met when she was in England at her dear friend Marjorie Ainsworth's home. Incidentally she and George worked together to solve Marjorie's murder. Visiting the Fisherman's wharf, Golden Gate Bridge, Ride on the Cable Cars and also a bit of romantic rendezvous with George - these were on her list. Little did she know that she would be tangled with a murder, albeit this was a closed case. All of it started when she visited the women's prison to talk about writing and benefits behind it to the prisoners. All though the talk / discussion went well - more than she had expected - she walked out with a diary in her bag, unawares. A diary belonging to one Kimberly Steffer convicted of murdering her husband Mark Steffer. She was a noted author of children's book. Intrigued by the diary, Jessica peruses through it and decides to help Kimberly in anyway she can to prove what Kimberly stated in her book - that she was not guilty of the murder. In the process she meets with Bobby McCormick, a reporter who had covered the trial, and believed in the innocence of Kimberly. Mark's partner in the restaurant "What's to Eat?" in Sausalito, Robert Fredrickson - a character that Kimberly describes as "he was capable of doing anything to get what he wants". She has a tense encounter with Nancy Antonio and Joan Steffer (Mark's first-wife) which doubles her determination to help Kimberly and her step-daughter Ellie. As her investigation moves forward with help from George and Bobby, she encounters another murder/ suicide of Brett Pearl - an illustrator who had worked for Kimberly Steffer. Is his murder / suicide connected in any way? Who killed Mark Steffer? Why was someone trying to kill Jessica Fletcher? Despite the risk to her life, Jessica works through the hurdles with aid from George and Bobby and eventually solves the true crime. As opposed to the other books published in recent years, this plot was a bit more complex and had well enough twists to make it interesting. Keeping the element of surprise till the end was perhaps the key for this plot to be enjoyable. Another good book for a lazy night.